1920s (flapper) dresses 1, XS, S and M. Original and reproduction. Flapper dresses were worn loose. See also Women's Hats for 1920s headwear, and ChD 13 for a flowergirl dress..
2014 XS. 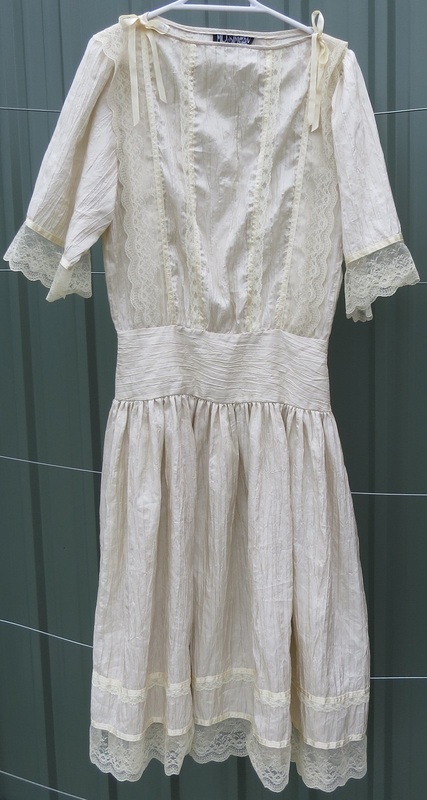 Original 1920s dress in ecru lace, soft and supple. B 76cm, drop waist / hip 84 unstretched; there is some give to the lace, but it is best regarded as a size 6, since flapper dresses were worn loose. About 107cm shoulder to hem. Slipover style, no closures. the sleeves are open below. The front skirt is gathered to the drop waist; the back is straight. $120. 203 S B 86, W 92, hip 105, length 138cm. Original 1920s dress, embroidered netting and lace. Sheer. Has a few tiny holes and stains. Photographed over a lilac slip (not included in price). $100. 205. S-M. B 89, drop waist 84, length 114. Designed to be worn loose. Around 1918, feels like crepe. $180. 704 B 101, W 69, underarm to top of waistband 20, waist to hem 72cm. Shantung silk. Australian designer Mr Simon; late Edwardian/early 20s style, made in the 1970s. $30.